Contract Guardian Delivers Extensive Capacities in the Searching, Filtering and Reporting of Agreements. Terms - Search terms without double quotes will be treated as single terms. Ex: Search Terms. This will be treated as "Search" "Terms" and both words will be found in your meta data, contracts and contract attachments. Phrases - A group of words surrounded by double quotes. Ex: "Search Terms" This will be treated as one word and will only be found when both words are found in that order. Fields - You can search any field by typing the field name followed by a colon ":" and the term you are searching for. Ex: title:"Search Terms" This will search for something with the title of "Search Terms". Since Contract Guardian provides you the option to create unlimited contract types and unlimited user defined fields; you can define very refined searches. Wildcard Searches - Contract Guardian supports single and multiple character wildcard searches within single terms. To perform a single character wildcard contract search use the "?" symbol. To perform a multiple character wildcard search use the “*” symbol. The single character wildcard search looks for terms that match that with the single character replaced. For example, to search for “contract” you can use the search c?ntract. Multiple character wildcard searches look for 0 or more characters. For example, to search for sign, signature and signs you can use sign*. You can also search your contract management repository by using the wildcard search in the middle of a term. The filtering is provided in the following contract support grids: Contracts, Contract Types, Contract Statuses, Other Parties for a Contract, Contract Attachment Types, Task Types, Custom Contract Fields, and Custom Contract Fieldsets. The Contract Administrator has these features as well as system administration filtering on Contract Management Users, Roles, Permissions, Organizations and Departments. Note: All of the contract management grids provide the client the ability to export their data to Excel or a PDF document. Contract Guardian enables you to construct a report using criteria from any of the contract management field including user defined. 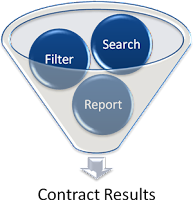 Filtering (selecting) data is performed by a drop down menu of all the fields available in the system. Based on the field, it will present various options like (equals, greater than, less than), date from a pop up calendar, contains (example would be a drop down list of users). You can then add additional condition via the AND/OR inclusion. For example: You might want all contracts that are of the type LEASE and have a contract value greater than $1,000. Once you submit your results you can see your results almost instantaneously. The grid presentation allows you to scroll left and right. It also allows you to sort on any column as well as drag and drop a column into the sequence you desire. You can name and save the report definitions for future use. Like all of the contract management grids, you can export the report to either Excel or PDF. One can also link directly to the document from the report results.